Justin Crighton, a planner with the Northeast Georgia Regional Commission, got a polite pushback Tuesday night as he presented his proposed timetable for the work of the Stakeholders Committee for the Oconee County Comprehensive Plan at the group’s first meeting. Crighton proposed five subsequent meetings of the citizen committee, including a session on March 14 to begin discussing land use issues in the county. Several of the members said the timetable was premature, arguing that the citizens needed to get to know each other first and develop their own strategy for producing the Comprehensive Plan by the state-set deadline of June 30, 2018. Crighton countered with a modified plan that brings the group back together in a month with a more open assignment to discuss how to proceed in the future. That meeting of the Stakeholders Committee on March 14 will follow a general session with the public. Crighten said he will go over with the public the broad strategy for producing the state-mandated revision of the county’s 2008 Comprehensive Plan, much as he did on Tuesday night with the Stakeholders Committee. Crighton, serving as a consultant to the county, said the state Department of Community Affairs has simplified the requirements for the Comprehensive Plan, making the final report more concise than when the county when through this process 10 years ago. All counties are required to include sections in the final report on key needs and opportunities the community wants to address, on the community vision for the future, and on a community project list for addressing issues and achieving its goals. Oconee County, because it has zoning laws, also must produce a land use plan, Crighton said. In addition, because Oconee County is part of a metropolitan transportation study group, it must produce a transportation report. The county could opt to include other topics in its Comprehensive Plan, such as a section on greenspace, public safety, education, and natural resources, according to Crighton. Crighton proposed that the Stakeholders Committee focus only on the five required components, setting a meeting aside for discussion of each. The work of the Stakeholder Committee, under this schedule, would be completed by Aug. 15 of this year. The county would hold two public hearings on the final product, with the second on Dec. 12, 2017. Crighton and his staff at the Northeast Georgia Regional Commission would put together much of the material that would go into that final report. Watkinsville Council member Brian Brodrick was outspoken at the meeting. Some members of the Stakeholders Committee, including Brodrick, asked for more guidance from the county and city elected officials before moving too far in their work. 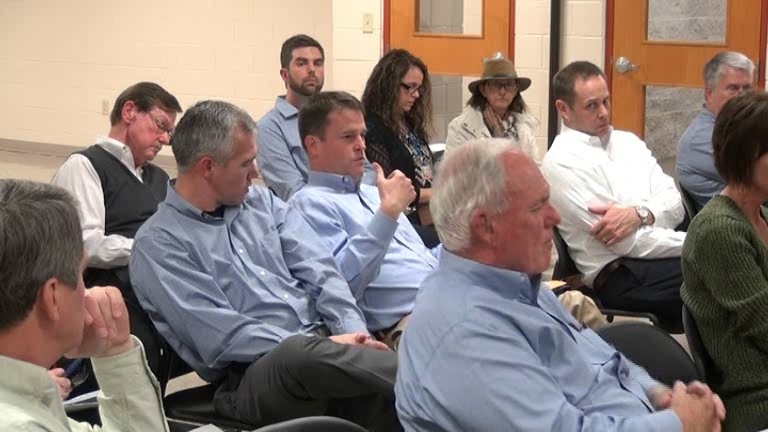 Ed Perkins, a member of the Stakeholders Committee who served on the citizen committee 10 years ago when the current plan was produced, was particularly adamant that the group needed input from the Oconee County School system. “One of the flies in the ointment of the strategic plan is the school system,” Perkins said, noting that it does not need to follow planning regulations of the county or even coordinate its decision on school location with the county. “How do you plan to get the input for us to consider from the school system?” Perkins asked. Crighton said that Philip Brown, sitting in front of Perkins, represents the Board of Education on the Stakeholders Committee. The meeting, held in the Community Center at Veterans Park on Hog Mountain Road, began with introductions of those present. Twenty-five of the 29 members of the Stakeholders Committee were present at the meeting's beginning, and a 26th came in after the introductions. Michael Prochaska of The Oconee Enterprise, Russ Page and I were the only citizens not on the Committee who were present. 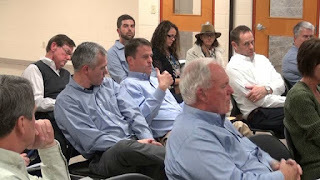 Board of Commission Chairman John Daniell and Commissioner Chuck Horton were in the audience, as were county Planning Department staff members Sandy Weinel and Andrew Stern. The complete video of the session is below. OCO: Comprehensive Plan 2 21 2017 Complete from Lee Becker on Vimeo. 1) Good to see the advisory group push back and show some independence. No more Melvin's way or the highway of years past. 2) If there isn't already, a Board of Education member should be an ex officio member of the group, and even the superintendent or another school system administrator. The BOE is represented. See the section under the Head Pushback. "Crighton said that Philip Brown, sitting in front of Perkins, represents the Board of Education on the Stakeholders Committee." Asking for guidance from the county on how to proceed is a bit bothersome. Is this going to be an advisory committee with citizens in mind acting to set precedent, policy, and procedure for future actions, or is it going to be just another committee with only the appearance of input? The revelation that the BOE can ignore any decision is also troubling.